← A Bad Hare Day! It’s always a good time visiting my parents in Florida. 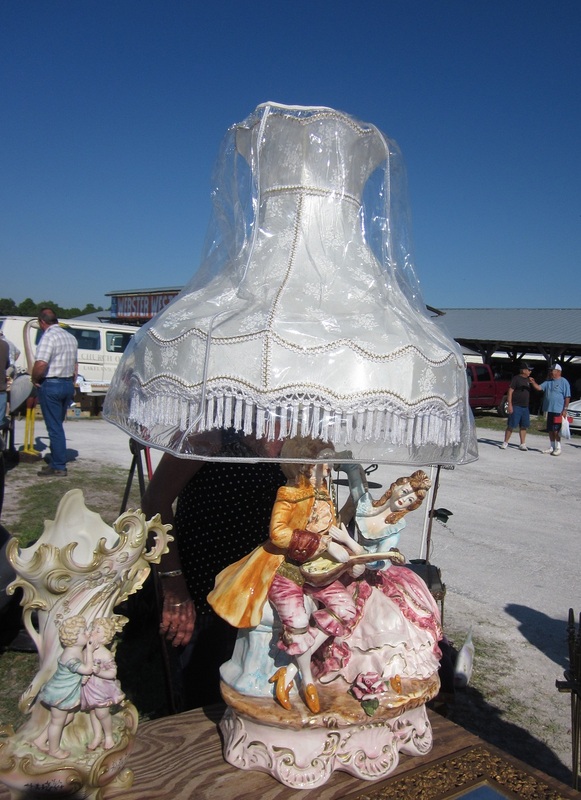 They live northeast of Tampa and southwest of Orlando; it’s prime flea market, thrift store and garage sale territory. 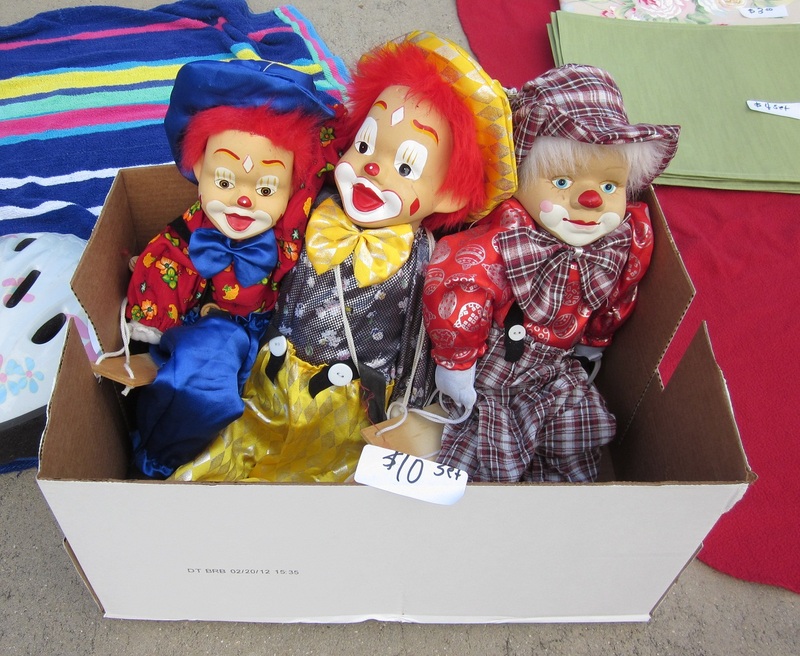 In fact, you should think of it as a sport there; people trade info and plot their garage sale tactics all week. Of course my parents participate–where do you think I got it from? While there is a strawberry tree (Arbutus unedo), it isn’t related to the fruit we call strawberries (Fragaria × ananassa). Okay, enough botany, all I wanted to say is: this cover is inaccurate as well as ugly. I’m not certain why ferns are growing out of the strawberry pot; but what the hey, this couldn’t get much worse. Per our agreement, after the last clown incident, here is fair warning that there are clowns coming up in the post. 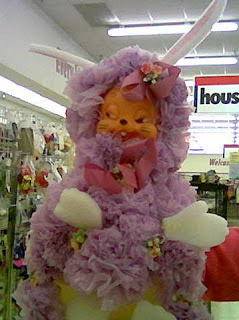 Don’t be too afraid, they are only medium ugly and probably not fatal to the viewer. Realistically, the thrift store should be paying someone $10 to haul this box of trouble away. Please, please use them for attic insulation–don’t give them to some innocent child. Because of the dark windows, you cannot see how absolutely chock full the van is. Several folks were around the van, piling stuff on top and shoving it inside. We had a theory that they had a van for hauling, and a van for transporting people. 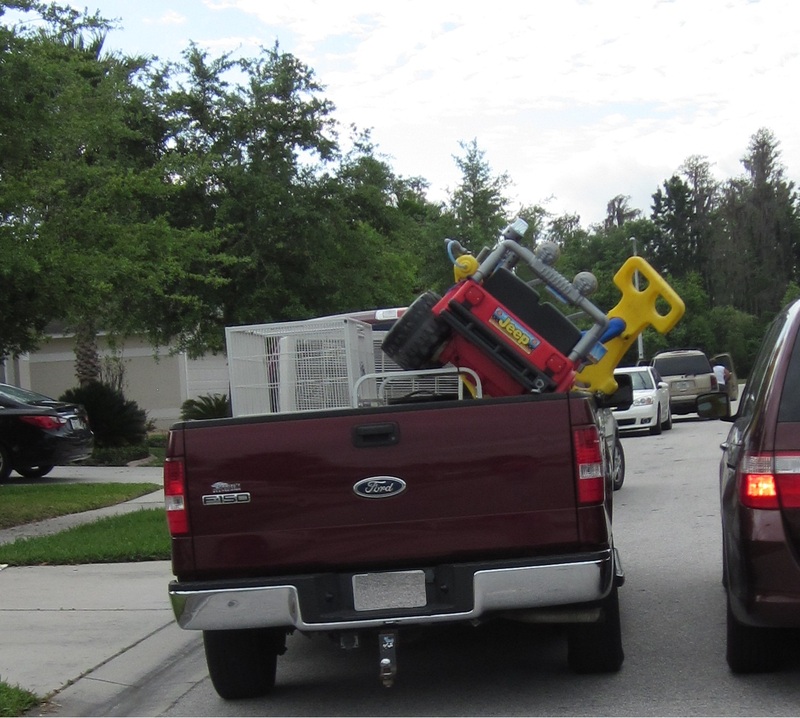 I asked to take a picture, but wasn’t fast enough to get a shot of the cargo area. What they needed were those train stuffers they use in Japan to fill every iota of available space. 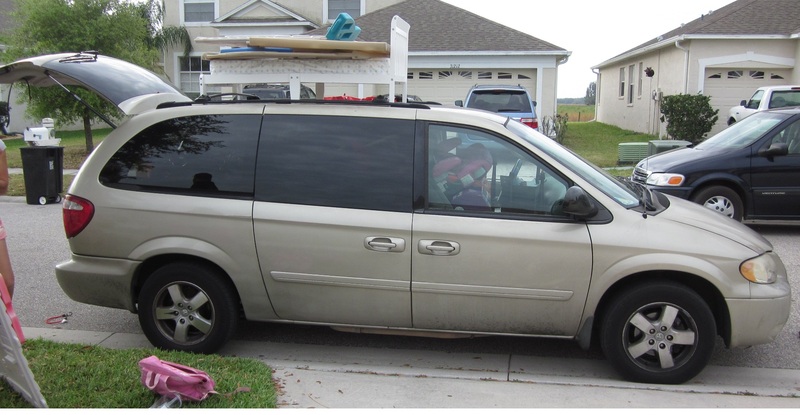 We followed them from garage sale to garage sale; the van was particularly easy to spot with the kid’s bed on top. 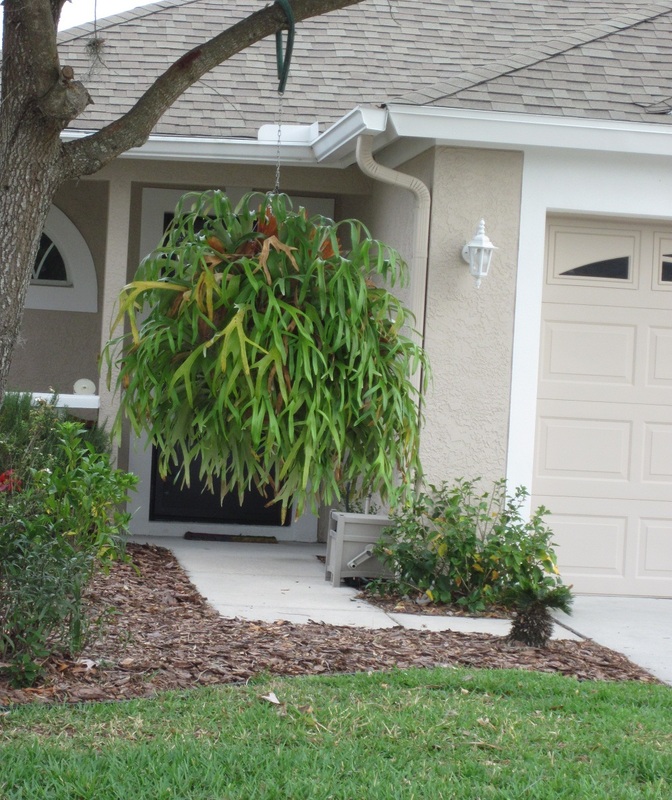 What a fabulous Staghorn fern! It would be difficult to grow this in Colorado without the perfect indoor spot, yet it’s so happy outside in Florida. 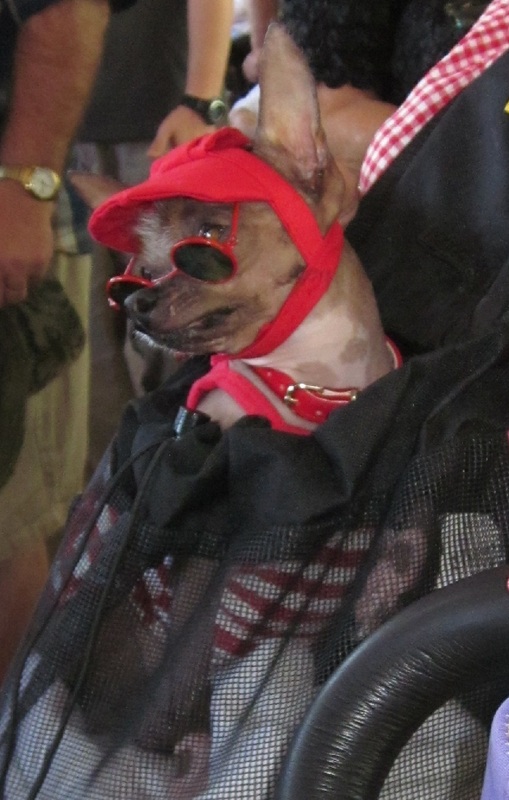 This little guy is a Chinese Crested-Chihuahua cross, and he had two sisters in a stroller all decked out in dresses, hats and sunglasses. The girls’ picture turned out too dark because of all the netting around the stroller. Their owner was very proud of them, and posed for numerous pics; I hope you can see his little striped shirt through the netted carrier. 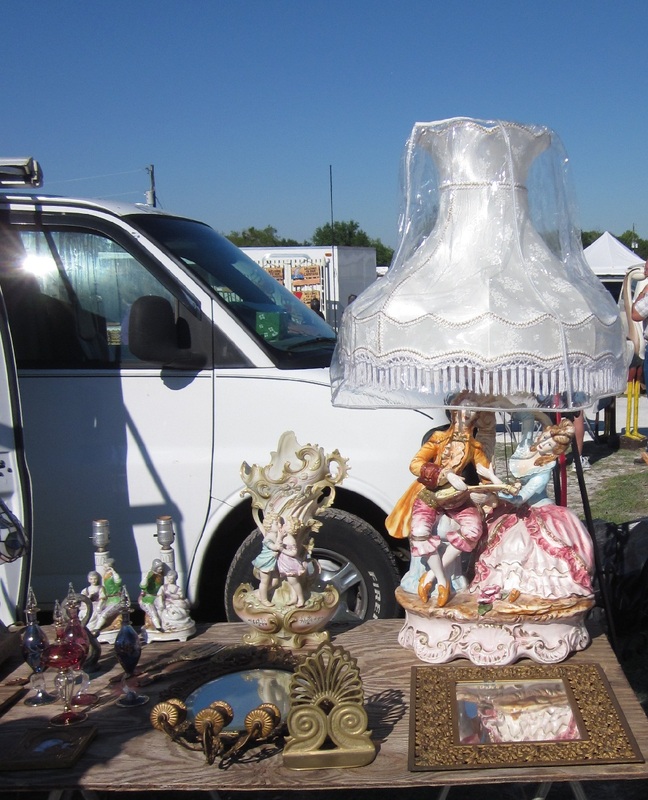 The lamp caught my attention since it was so big, but the kissing cherubs vase is awful too. What is the lady in the lamp doing with her right arm? It looks like she is using all her might to push Mr. Lute player away–very bizarre. Or maybe she is swooning from the din he is making. That stupid plastic shade cover makes it difficult to see the lamp clearly. More likely it’s a German punch bowl, since there looks to be a slot for a ladle. 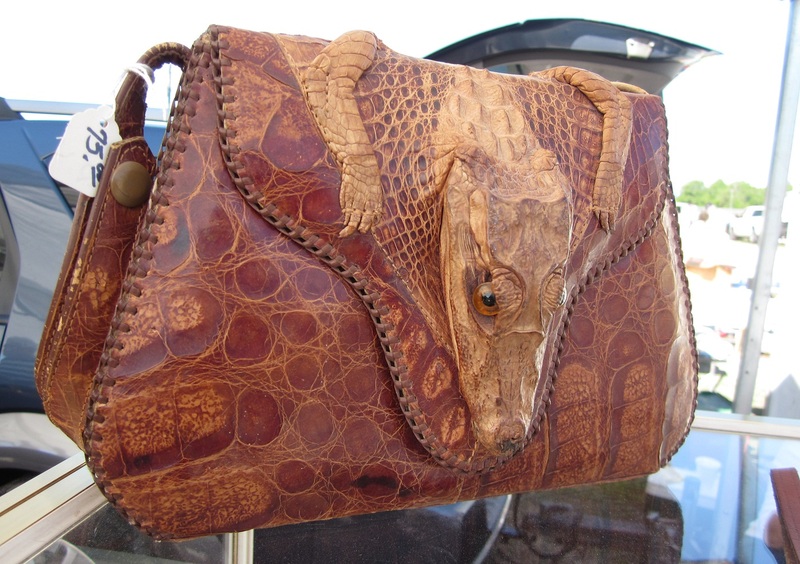 I suppose being a purse is preferable to ending up in a New York sewer. 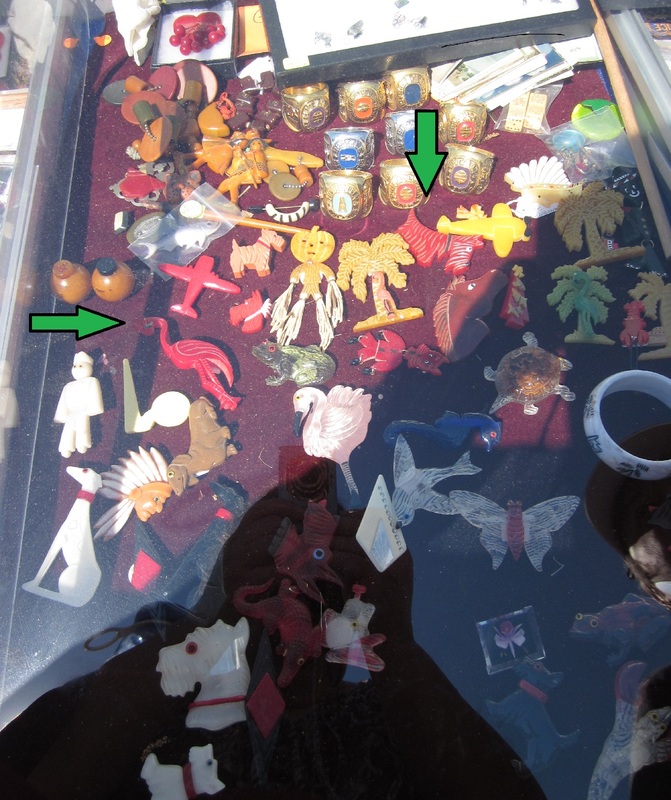 Although my crappy picture makes it hard to see, there are carved Bakelite pins in this case. I asked to see the flamingo and the Scottie dog (green arrows). 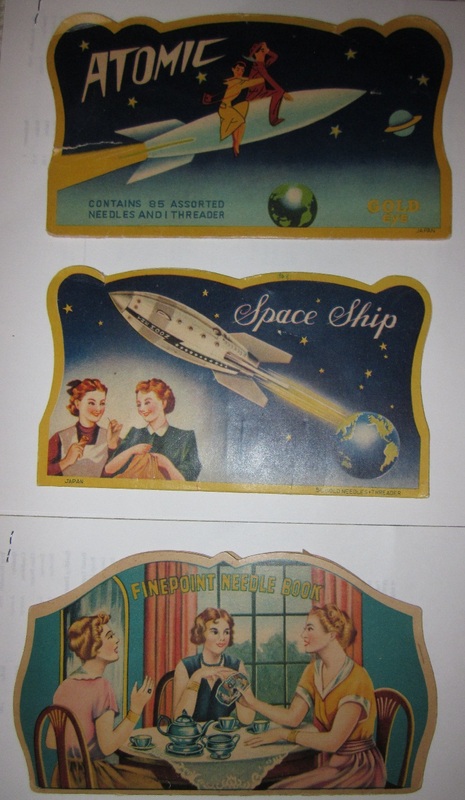 As always, my taste is impeccable; they were two of the most expensive brooches in the case. I can’t remember how much the Scottie dog was, but the flamingo was nearly $300. The seller claimed they were Ron and Esther Shultz pieces, which could be true since there is a Shultz Bakelite company in Lakeland FL. I would have checked for a mark, if I was planning to make a purchase. 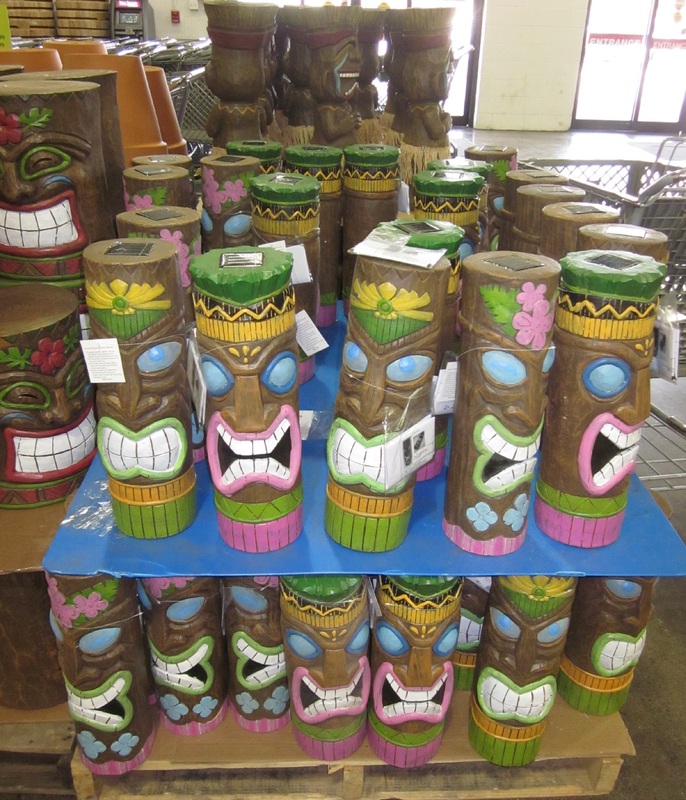 you understand why tiki is often paired with tacky. These tiki decorations have solar panels on top; I guess it’s to make their hideous eyes glow blue. That could be disturbing if you have had a couple too many gin & tonics. Well, that’s it for the trip report, Second Hand Rose style. 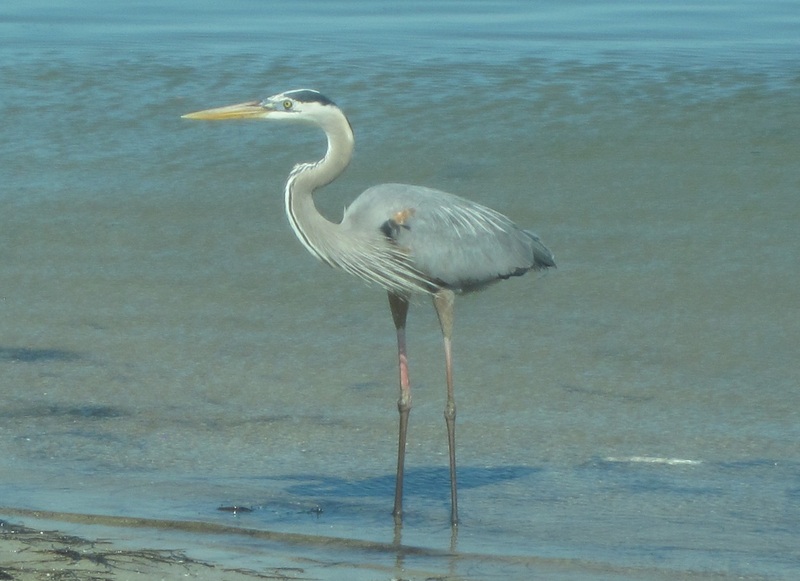 I’ll leave you with a last picture of a fellow who kept us company for an hour at Fort De Soto Park. He was fishing, and we were looking for shells and watching the water; it was a day made in heaven. 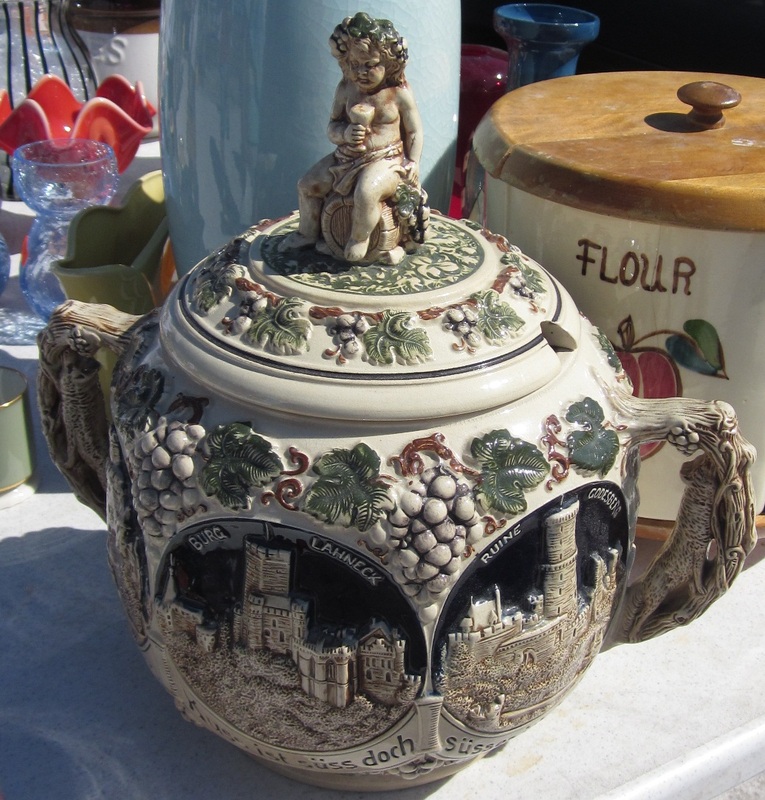 This entry was posted in Friday Finds, Vacation Fun and tagged Angels/Cherubs, Animals, Figurines, Fun People pix, Garage Sales, Household items, Jewelry, Pins, Purses, Thrift Stores. Bookmark the permalink.